Yesterday regional elections took place in France. Google have produced a mapplet in collaboration with l'Agence France-Presse so that you can view the results of the election on Google Maps. You can view the results of the 2004 elections or you can choose to view the results of yesterday's election (as the results become available). 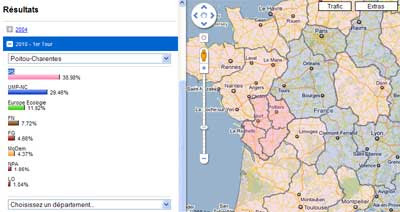 You can click on any location on the map to view the results for that region. PS (Parti Socialiste) are coloured pink and the UMP (Union Pour un Mouvement Populaire) are blue.